The Ultimate Sound & Frequency Webinar | Get Access Now! In the beginning there was the WORD… and the WORD was with God and the WORD was God. What is the word? What is this primordial sound that is found in abundance in all creation stories. We are shifting into an era in human consciousness in which the vibratory field and awareness of frequencies and dimensions are going to soon be integrated into our daily understanding of reality. What if this new discovery wasn’t so new? This is the sound that existed before all material matter. 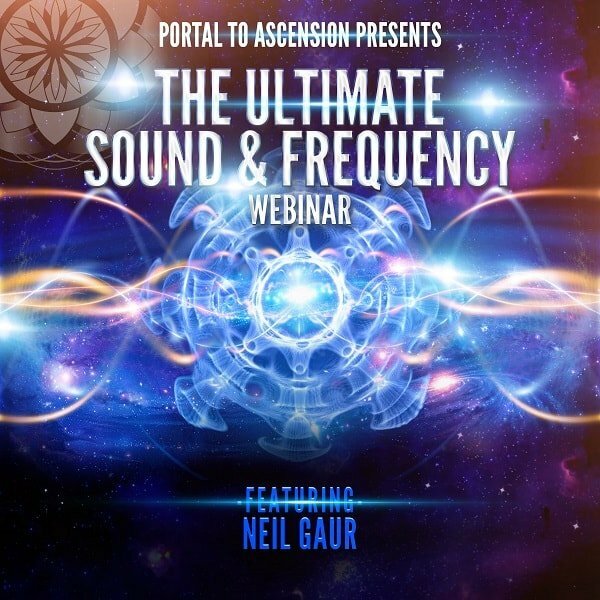 Join Neil Gaur for this 3 hour visual journey into the sacred past to understand the truth of sound and vibration & also explore the scientific and quantum physical connection to all that is. Neil will close the presentation with future applications of this awareness rising on our planet. I was raised in a Hindu family and I pretty much considered myself an atheist Hindu. I say this because I did all the rites and rituals that my family told me to, but I didn’t really believe. I just did what I did because it was expected of me. When I graduated highschool in 2000 and went to California State University Fullerton I began interacting with a variety of different people and exploring a range of music. I began writing poetry that turned into spoken word that I would present at open mics. My poetry portrayed a lot of confusion, questions and a spiritual connection to life with an underlying feeling that something is missing or out of place. In my first year in college I discovered a series of videos from different conscious presenters. These individuals were Nassim Haramein, Jim Self and Jordan Maxwell. I began watching a lot of Jordan Maxwell videos that introduced me to the ancient civilization of the Sumerians. This led me to Zachariah Sitchen and Erik von Danken’s work with the Sumerian Scriptures. This awareness took me back to the religion I was raised in, Hinduism. I looked at this faith from an entirely new perspective… dissecting all that I could. The information on vibration and connection to quantum physics and the universe that was portrayed in the Sumerian Scriptures were very similar to the Hindu text. The Hindus speak of vibration and frequency and how this connects to meditation and other holistic practices. There were too many coincidences and then I ultimately realized all the universal truths hidden in plain sight within the Hindu scriptures. My mind was blown. I was reading translations of the scriptures that were the exact same stories found throughout other religions in the world. However, these scriptures dated back 1000’s of years before the world bibles spoke of the same stories. I also discovered that these similar stories were talking about a race of beings that do not live on the planet. The Annunaki who came from a planet called Nibiru, which is the 10th planet in our solar system that has an elliptical 3600 year orbit around our Sun. This information lead me to the notion that either the majority of major religions in the world are inherently wrong because they are taken from these texts, or all the world religions are actually talking about Extraterrestrial beings. This made a lot of sense to me and I went down the rabbit hole of information and awareness. I delved deep into the conspiracies and the corruption. I felt that there was a disconnection in the world and that we as a species are wondering aimlessly allowing ourselves to be manipulated and controlled. I was so angry, feeling that I had been lied to my entire life. That everything I know was wrong; however, I also felt reassured that I had always known something was not right. I stayed in the darkness for a while, a bit scared and very confused. I wanted to do something and help shift the consciousness on the planet. In 2006, after 6 years of intense research, I created a Facebook group called “2012 Consciousness, Mind, Evolution and Presence”. I created this group because I was interested in knowing who would join and sharing all this information with my friends. Within a matter of months 100’s of people began joining and within a year we had a few thousand members. Now we have a huge social media network and groups for a range of different countries and cities in the world. In 2007, I had a dream in which I was told to change the name of the group to “Consciousness: Evolution and Presence”, and then a few months later to “Cosmic Consciousness: Presence”, until eventually in summer of 2008 I had a dream in which I was told that the name of the organization will be “Portal to Ascension”. That was the same exact Summer I was fired as a financial analyst and I met a group of friends that became my soul family to this day. Summer of 2008 was when Portal to Ascension was born in spirit, in physicality and with direction. Soon after we conducted our first event at a holistic center in Costa Mesa, California called “Ginger’s Garden Wellness Center”. From that moment up until today we have been creating bigger and bigger events that ultimately lead to two huge conferences (Cosmic Reunion 2012 and Cosmic Reunion: Fourth Density) in 2012 and then into our state of the art online webinar platform we are currently using.